It’s hard to find Mexican food that’s grain-free. I assume it’s because people want warm tortillas or corn chips with their meal, and figure it’s not worth making it without it. 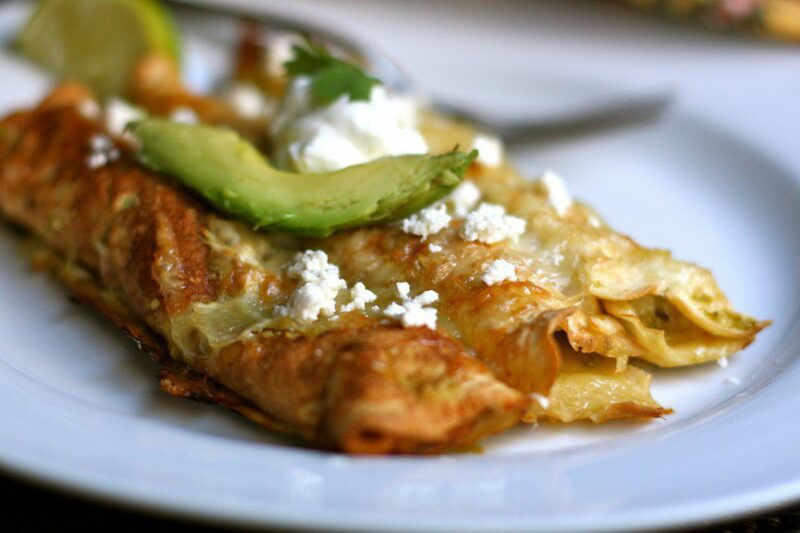 Well, these enchiladas will make it worth it to you. You won’t miss the corn tortillas, and served with a side of black beans, it will engage your taste buds and get you out of that cooker’s block. You can make the tortillas and the sauce the night before and refrigerate them to save time the night you’re cooking. Heat 2 tablespoons oil in a deep skillet. Saute onions and garlic until soft. Add the chicken breasts seasoned with 1 teaspoon of salt, browning each piece on both sides. Set aside until sauce is finished. In a saucepan, combine the tomatillos and Serrano chilies with enough water to cover. Bring to a boil over medium-high heat, and cook for 15 minutes. Roast the Poblano chili under the broiler and turn until all sides are blackened. Remove from oven and place in a plastic bag for 15 minutes (the steam in the bag will help to remove the skin). Remove the chili from the bag and peel the skin off. Cut it in half, and remove all of the seeds. Place the chili in a food processor. Drain the tomatillos, garlic, and chilies and add to a food processor. Process until a smooth sauce forms. Heat the oil in the saucepan until smoking. Quickly add the tomatillo sauce, stirring constantly, until the sauce bubbles. Reduce the heat to low and cook until the sauce starts to thicken, about 5 minutes more. Add the 1 Tbs. salt. Add the chicken to the sauce and simmer for 45 minutes until it is cooked through. Remove chicken and shred on a cutting board. Remove 1 cup of the sauce and reserve on the side. Add the chicken back to the sauce and adjust seasonings to your liking. Leave on low while you assemble the enchiladas. 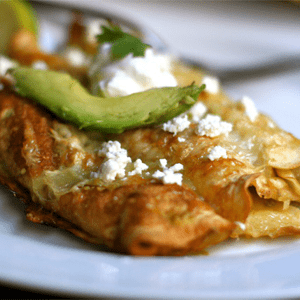 Fill each tortilla with chicken mixture and a pinch of cheese. Roll up and carefully flip the roll over so the seam is down. Place into a greased casserole dish. Continue with the remaining tortillas, placing them close together in the dish. If you have extra chicken or broken tortillas, you can use them to fill in the sides of the dish. Top with the reserved sauce and remainder of the cheese. Bake the enchiladas for 15 minutes and all the cheese on top is melted. Serve immediately topped with cashew sour cream and a sprinkle of Queso Fresco.